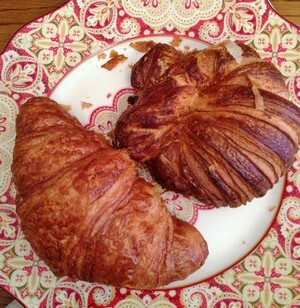 My friend, Julie Flanders, and the Accidental Locavore are always searching and debating the merits and sources for the best croissants in Manhattan. Together and apart, we’ve tried a lot of them from the usual suspects. Most have been lacking, some surprisingly awful-total wastes of money and calories (stick to making chocolate, Jacques Torres) and others redeemable with a little heat and the addition of some butter and jam. 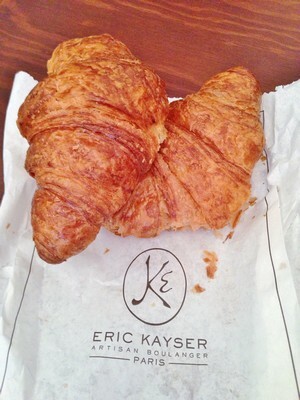 This particular morning, since I knew we had a full day ahead of us, I volunteered to trot downtown to compare an old favorite, City Bakery, with the latest French import, Maison Kayser. 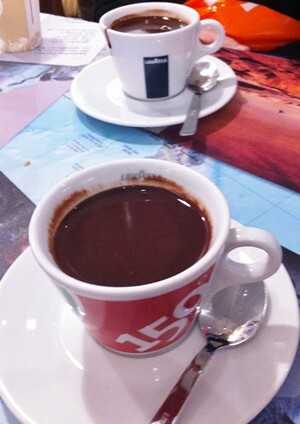 Everything is different, the prices, the bags, the spaces and the croissants. 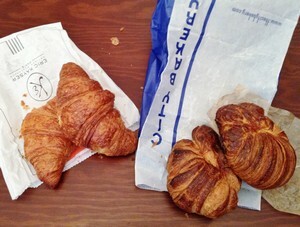 City Bakery’s croissants are big, whole wheat beauties, costing $3.00 apiece and wrapped in a standard bakery bag. Eric Kayser’s are in the more classic (i.e. smaller) French style and packed in a traditional almost-tissue paper bag, barely big enough for a pair and slightly less expensive at $2.75 each. Funnily enough, when I got to Julie’s house, her husband was more than willing to taste and provide a tie-breaking vote if needed. We plated the croissants and pulled off a corner of the darker ones. They seemed a little over-baked and were more doughy than flaky. To my mind, a good croissant should be a constant mess maker. No matter what you do, there should be a shower of flaky pastry. Not so much with these. They weren’t terrible, and a smear of maple butter made them pretty delicious. The lighter colored ones were next. Same procedure, pull off an end and eat. Ahh…flaky pastry with a distinct buttery taste (and crumbs everywhere). We looked at each other and smiled-no tiebreaker needed here. 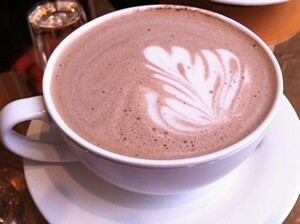 Just for fun, Emil briefly heated them to bring out their deliciousness, and then they were gone. The big winner? Maison Kaiser. Probably one of the best croissants I’ve had in New York. Just the right size, full of flavor and a perfect texture. Try one and let me know if you agree.